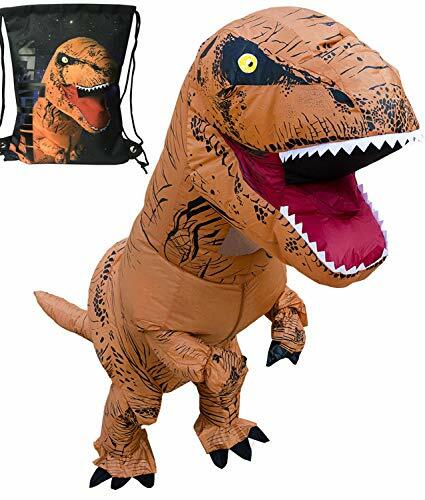 LUCKYSUN Adult Dinosaur Shape Inflatable Costume T-rex Pterosaur Scale with Exclusive Drawstring Bag | What Should I Say? Ship with exclusive Luckysun durable drawstring bag (For free). The inflatable costume suit for games, bars, clubs, dance PARTY, parks, television programs, supermarket chains, hotel chains, the annual events, carnival, festival, company annual meeting, opening ceremonies, Valentine,Couple Lovers,weddings and so on. Simple using method and fantastic look is your best choice for your fancy dress party time. ★★ Good quality -- this is not a one-time use product. It's 100% made in polyester material, durable, soft and comfortable. Even in hot summer, it will not bring discomfort to the body. ★★ Size - One size for person　from 5'3 to 6'5 (160cm-195cm). Maximun perimeter 160cm(5"3') for chest; Maximun perimeter 174cm (5"7') for waist. ★★ Inflate quickly--Fully inflate in 90 seconds. The 9000 rpm fans keep this Costume inflated all the way. ★★ Value -- Feeling too occupied after used? We present a special storage bag to solve this problem. Further more, when playing, this bag can also be used to carry personal items such as water, telephones, fans, etc. If you have any questions about this product by LUCKYSUN, contact us by completing and submitting the form below. If you are looking for a specif part number, please include it with your message.